SAN DIEGO — Construction of a 92-foot replica ship is taking shape along San Diego Bay’s Spanish Landing Park. 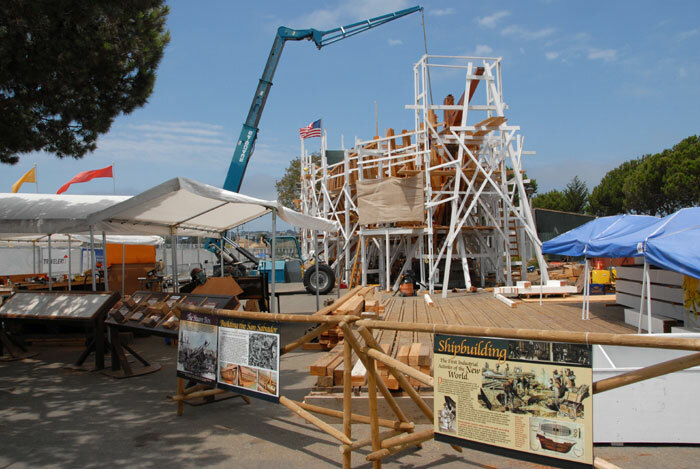 The project, run by San Diego Maritime Museum, is working to create a replica of the original San Salvador, called the “founding ship” of San Diego. The ribs of the hull, crafted of strong Southern live oak, are now visible from Harbor Drive, just across the street from San Diego International Airport. For a closer look, visitors are able to enter the shipyard — named San Salvador Village — and watch the construction. So far, about 9,000 visitors have toured the village, with many returning weekly to keep abreast of the progress. Bruce Heyman, San Salvador project manager, said the hull is scheduled for completion at the end of this year. The ship will then be launched, and the work crew will complete the rigging, plumbing, wiring and installation of electronic systems. Although the 200-ton re-creation – with a 24-foot beam — will look like Cabrillo’s flagship, it is being constructed with all current safety features to conform to Coast Guard regulations. This will allow the vessel to sail the California coast as a goodwill ambassador and provide “living history” educational programs for children, according to the museum. The voyage, which began in what is now Guatemala, resulted in the first appearance of the California region on a European map and was the basis for future colonization and development of the West Coast. Ashley said building San Salvador places emphasis on the history of America from a Pacific viewpoint and calls into focus that Cabrillo sailed into San Diego Bay 78 years before the pilgrims landed on the East Coast. “San Diego is one of the places where America began,” Ashley said. Upon completion, San Salvador will be docked with the museum’s fleet of ships at the North Embarcadero and is expected to draw visitors from across the country. The Port of San Diego has provided the construction site and annually provides financial support to the Maritime Museum of San Diego. “This is a once-in-a lifetime opportunity to build something this historic. This is the founding of San Diego,” said Bruce Heyman, who oversees 13 museum craftsmen and about 20 volunteers on the project site.